Water quality has deteriorated in India over the years and now water purifier is necessary for every home and office. In this article, we have listed the top 10 best water purifier in India 2019 under various price points like under 6000, 8000, 10000, 15000 and 20000. So doesn't matter what is your budget, you will be able to find a suitable water purifier here. In this article, we have covered best RO water purifiers from all top brands like Kent, Pureit, Livpure, AO Smith, Eureka Forbes and Blue star. These brands make high-quality RO water purifiers and offer good after-sales service as well. After sales service is important in water purifiers as you would have to change the filters and membranes after some time. We have covered various types of purifiers on this list. Some of them have 4 stages and some of them have 6. Usually, more stages mean better purification and higher price as well. If the water in your area is polluted then you should go with 6 stage filtration process purifiers. They are very effective in removing viruses, bacteria, and reducing TDS as well. Another thing you should consider before buying a water purifier is the storage capacity. If you get frequent power cuts in your area, then a purifier with good storage capacity should be your choice. Below you will find a brief review of each water purifier with its specifications, price and buy links. Prices keep changing every day so we request you to check the latest price by clicking on links provided. Let's take a look at best water purifiers in India. Just after this list of best purifiers, we have also given our favourite from this list. Kent Ultra Storage water purifier is value for money water purifier with a storage tank of 7L capacity. The storage tank is detachable for easy cleaning. You can keep this water purifier on a table or mount it on a wall. The storage with water level tank makes the purifier visually appealing and an ideal tool for use at homes and offices. The storage tank is helpful as it ensures supply of clean water even in power cuts. It works on a double purification method. The UF after UV removes dead bacteria, viruses, and cysts from the fine pores of Hollow Fibre UF Membrane, thereby providing 100% pure, safe & tasty drinking water, which is ideal for consumption. Since KENT Ultra Storage is based on UV and UF technology that does not remove dissolved impurities, it is suitable for use where inlet water has low TDS (Total Dissolved Solids). If you live in an area where TDS is high, you should not buy this water purifier. The Kent Ultra Storage has a computer controlled operation which has two unique features – Filter Change Alarm and UV Fail Alarm. The time-based filter change alarm notifies the user to change filters and the UV fail alarm is for alerting the user when UV lamp becomes inefficient. In both the cases, power supply to the purifier is cut off, thereby ensuring that impure water is not delivered to the user. KENT Ultra Storage uses high-powered 11W UV lamp instead of the standard 8W UV lamp which provides complete de-activation of harmful micro-organisms. The High-wattage lamp ensures better safety against harmful micro-organisms like bacteria and viruses. The operation of Kent Ultra Storage is fully automatic. It will start automatically when the water level falls below a level and then switches off when the storage tank is full. This ensures full automatic operation 24x7. Kent Ultra Storage has a built-in rugged SMPS (Switching Mode power supply) instead of a power adaptor. It can handle a wide range of input AC voltage (100 – 300 Volts) which means voltage fluctuations won't impact this water purifier. 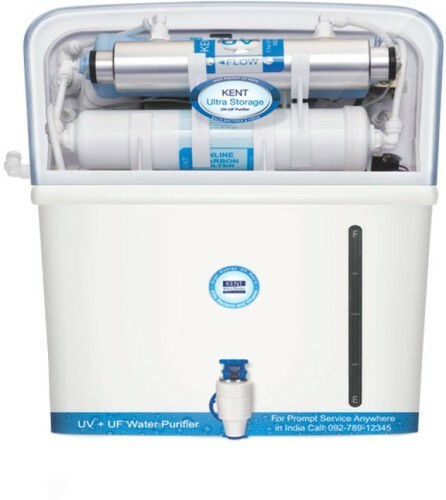 If you are looking for a UV+UF water purifier under 7000 then this is a good option from Kent.